Patrick was born and raised in Hamilton, Scotland. As a young man he traveled to America and settled in the San Francisco bay area with his family. Joining the U.S. Army just prior to the Korean Conflict, Patrick met his wife Rosalie, while based at Fort Lewis, Washington. Upon their marriage, they made Seattle, Washington their home. Patrick always had a fascination with anything pertaining the ancient arms, especially edged weapons. 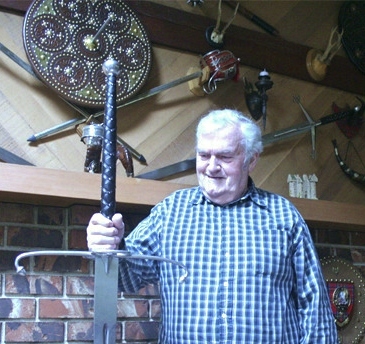 After spending many years of his spare time researching and gathering his own collection, Patrick started making his own targes to help display his collection of swords. Soon other collectors became interested in Patrick’s targes, commissioning him to design and fabricate pieces for themselves, thus the beginning of Scottish Sword & Shield. After 25+ years of Scottish Sword & Shield, Patrick has begun to truly begin his retirement. The legacy of the business continues through the family with granddaughter, Megan, starting Scottish Sword & More. Megan has been involved in the Scottish community since she was a child, growing up participating as a Highland Dancer. You may have even seen Megan at the Highland Games as her time during summers growing up as a child was spent at the various west coast Highland Games. To continue to family business, Megan has continued with much of the gifts and items that you have come to know over the years from Scottish Sword & Shield, but under a new name: Scottish Sword & More.